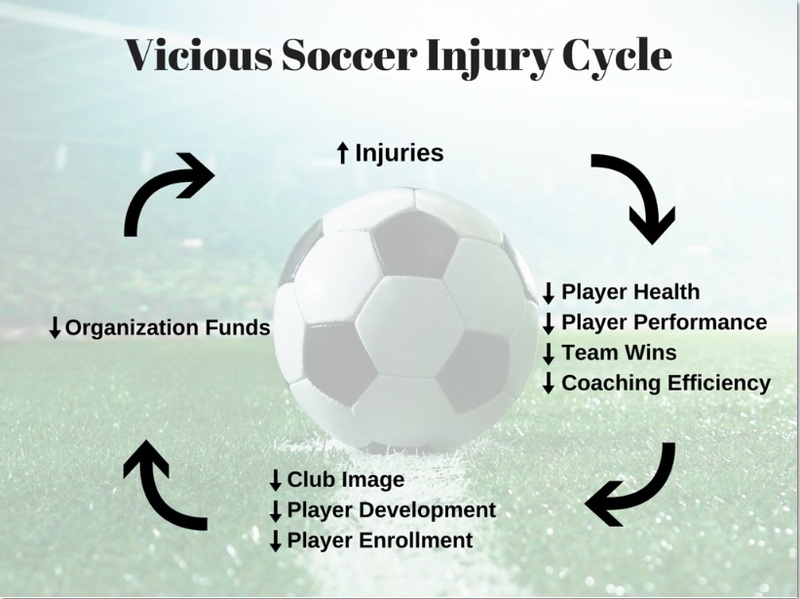 Injuries affect the entire soccer organization and create a vicious soccer cycle. Not only can injuries hurt player’s performance and development, they often lead to long-term health consequences. Teams with multiple players out due to injury may not have as many wins. Injuries also decrease the efficiency and effectiveness of coaches and their support staff. These factors, in turn, could damage the organization’s image, decrease player enrollment, and negatively affect player development. This leads to fewer profits for the organization and fewer funds to spend on injury prevention. Thus, the vicious soccer cycle continues. Prevent Soccer Injuries: The On-Field Manual for Coaches, Parents, Players & Clubs to Maximize Player Development & Performance is designed to help break this cycle.